President Schulz, your social media use is missing the mark. The success of WSU's mission, students, and community is my number one priority as a student-leader on campus. President Schultz' success is our community's success. My sole intent is to share my opinion on this topic. I regret to inform you that we have never met. My name is Amanda Tomchick, and I am a junior pursuing dual-degrees in communication and society (risk and crisis emphasis) and strategic communication (public relations emphasis). I am a member of the WSU Honors college, Tri Delta, and I'm planning to attend graduate school for student affairs after I graduate WSU in spring 2019. On Feb. 20, I read one of your tweets and it inspired me to write this article. 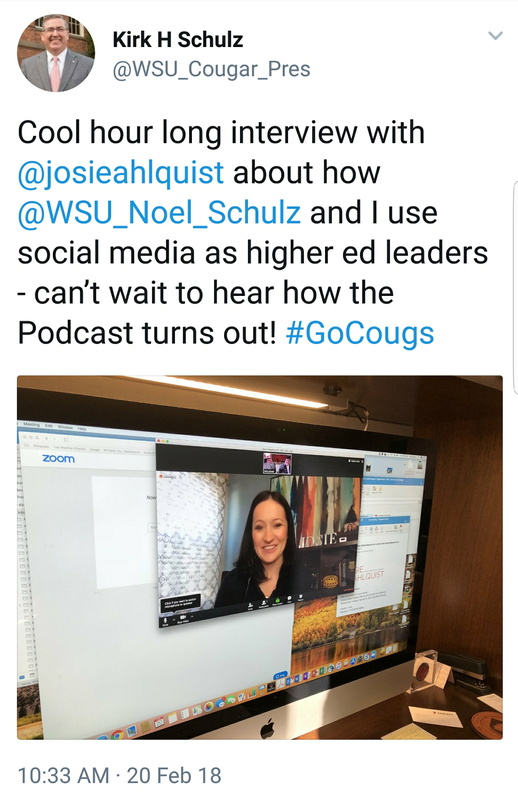 President Schultz, your social media use is a problem. I have spent many hours in the last few months thinking about your Twitter use. I follow you on Twitter and my mother often sends me favorite tweets of hers as well. I felt the need to write to you in light of you being interviewed on this podcast about your social media use. My interpretation of your intent is that you are trying to be transparent with students and the WSU community by tweeting about your role as president. 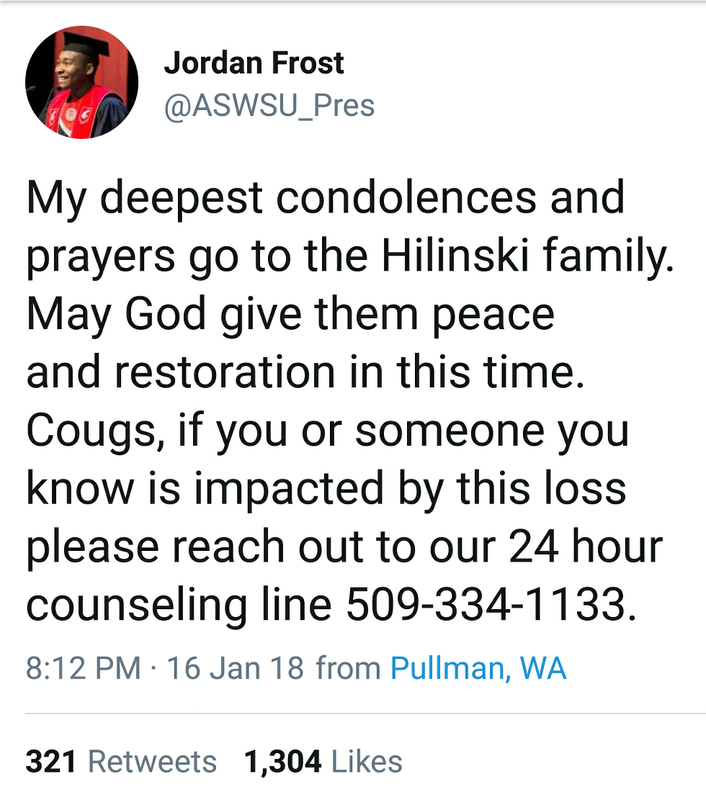 I don't think your twitter use is resonating with Pullman campus students and staff. I can see how your Twitter is great for alumni, parents, and folks from different campuses. I know that my mother loves hearing about what you are doing on a day-to-day basis. It helps her feel included in the WSU community. As a student on the Pullman campus, all I see is how little time you spend at events on our campus. Specifically, events that involve students. I understand that you are an extraordinarily busy human and the university is facing an extensive budget crisis. But, I had not seen you in-person until our MLK day celebration in January of 2018. You'll have to take my word for this, but I'm a very involved student. I show up for things and I'm involved on this campus. When I realized that the first time I had seen you at an event was about a month ago, I started asking peers if they had met or seen you around before. Very few students I spoke to had. I am excited to hear that you and Jordan Frost are meeting students in the CUB. I think that visibility to students is extraordinarily important. I hope you will continue with this, as I think it is in the spirit of our former president Glenn Terrell (WSU President between 1967 to 1985). As I'm sure you are aware, president Terrell would walk from the president's mansion to work every day across the mall and talk with students. I cannot find a reference for this, but it is rumored that it would take him an hour to get to work because he would stop and talk to so many students. Twitter is the first place many students go for breaking news. If you're going to use Twitter all day long to communicate about your day, you should also use it in a crisis. In my opinion, you don't get to have it both ways. 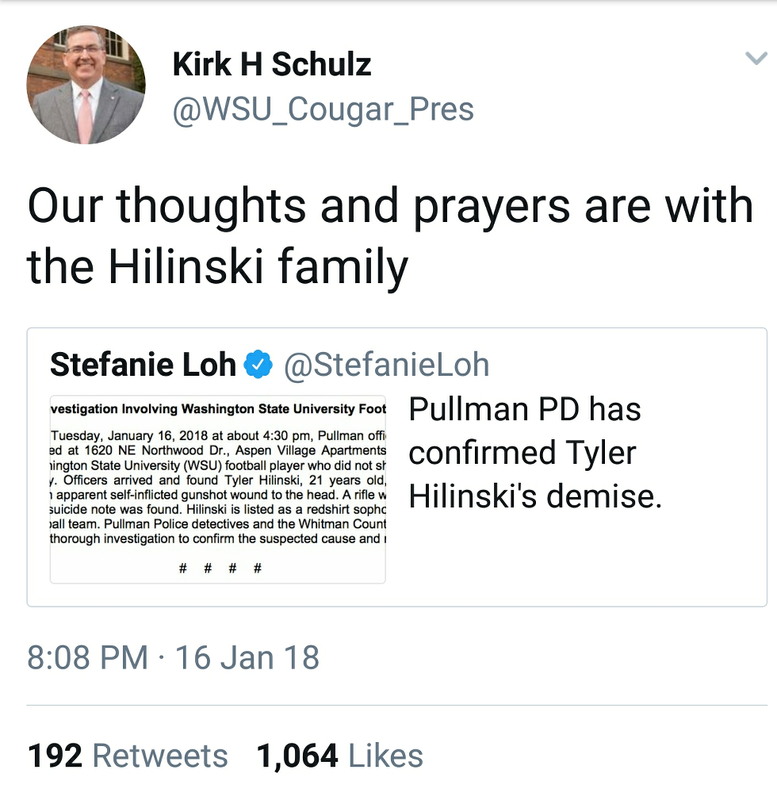 I'm deeply confused why you, the WSU president, are retweeting a journalist that was tweeting a picture of the press release that the Pullman Police Department wrote. First, it appears like you're learning about this information from the journalist. Second, this tweet shares no helpful information about resources to students. Later on in the evening, you retweeted resources from other WSU community members that had tweeted them out. Why isn't that information coming directly from our president? Why isn't your resource tweet the one everyone is retweeting? In COMSOC 477, risk communication, I learned that expressing empathy is one of the most important aspects of communicating during a crisis. Your tweet is robotic and comes across as "the thing you should say" and not authentic, like Jordan's. When you do tweet about issues related to students, you don't seem relatable. I will acknowledge that Siobhan's tweet was a little outlandish. However, I still feel that your response alienated students. In my experience, the problem of accessibility and safety, on our campus, during poor winter weather conditions cannot be solved by just being "careful while walking around." There are sheets of black ice all over campus that are not sanded. For example, the sidewalk right outside of the Global market is incredibly dangerous and has been covered with black ice for all of last week. 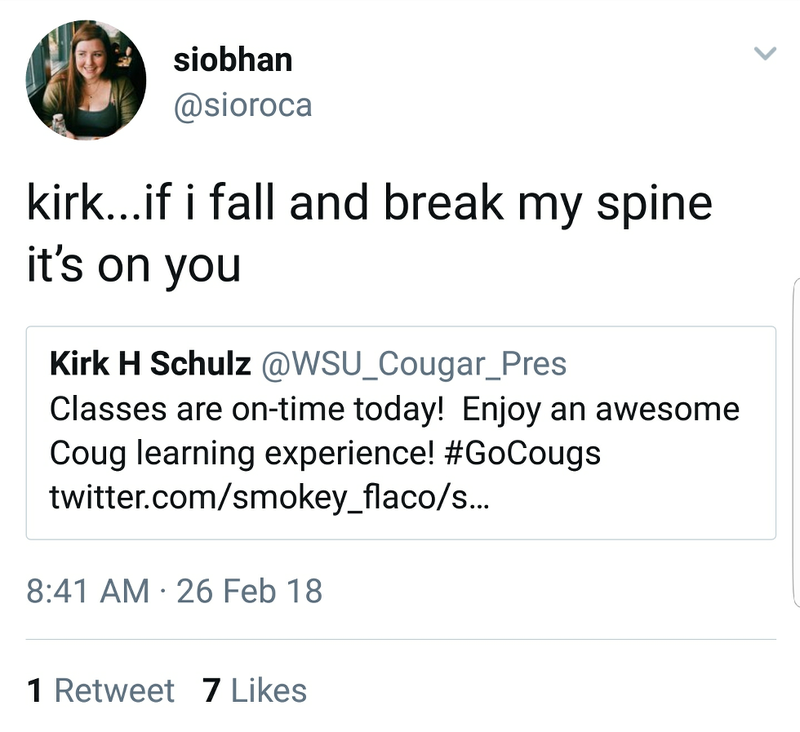 I would have suggested responded to Siobhan something along the lines of, "Please be careful walking around campus today. If there are areas where our snow and ice removal on campus could be improved you can contact _____. We want our campus to be safe for Cougs going to class." Both you and Noel only use one Twitter account each, but share both professional and personal information to those accounts. I know that it might be confusing to some, but I think that will clarify what information people are expecting from your account. I think that Jordan has done an extraordinary job of this. 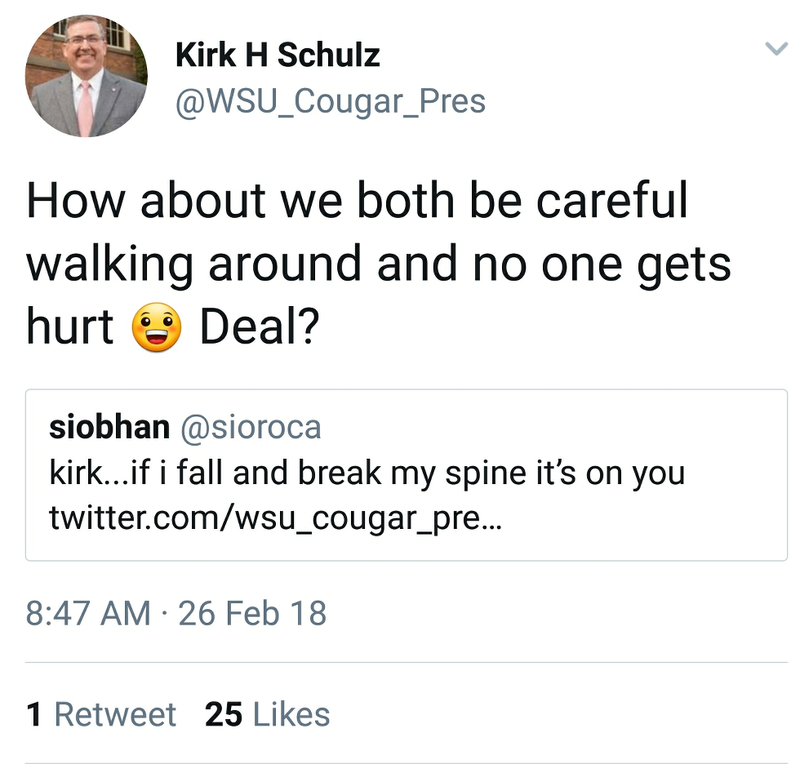 He still comes across as personable on his official ASWSU account, but it's only about work-related information. To be clear, I am not arguing that Jordan's social media use is perfect and it may not be fair to compare your knowledge of social media to that of 'millennials.' But this brings me back to the podcast; if you're going to talk about being social media savvy I think that it is fair to compare the two of you. 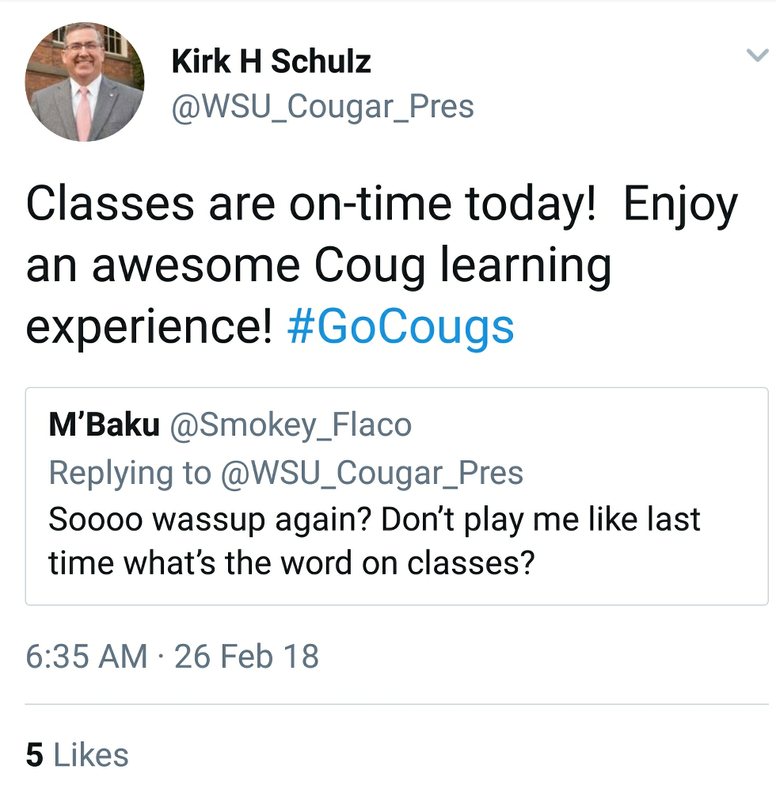 WSU has one of the best communication schools in the nation. There are courses on public relations you could sit in on. Or maybe you could do a forum strategic communication professors and students about social media. There are endless ways that both sides could grow from a conversation about organizational social media use. Thank you for taking the time to review my feedback. I cannot wait to see where will continue to steer our university. I hope that you, Noel, Cayenne, and Joule have a wonderful rest of your day. Disclaimer: This article was written before the release of the aforementioned podcast. You can listen to President Schultz and First Lady Noel's episode here.